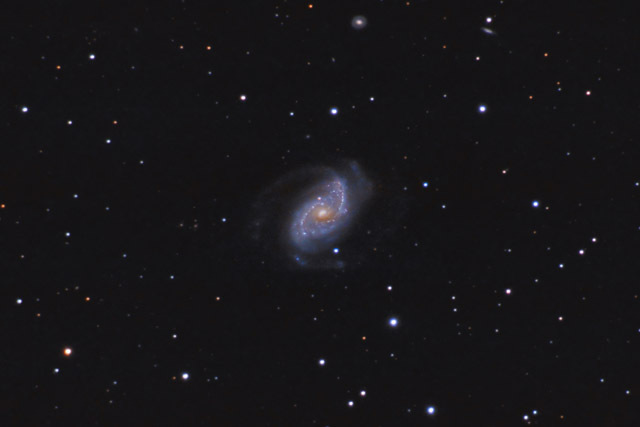 Also known as Caldwell 45, NGC 5248 is a beautiful spiral galaxy which is a member of the Virgo cluster of galaxies. The galaxy is classified as a star burst galaxy. At 6' x 4' angular size, the galaxy is a challenging target. In this photo, North is Up. This image is cropped to 42% of the original full frame. Software Used Images Plus 5.0 for camera control, IP 5.5 Beta for calibration, stacking, digital development, star shrinking and halo reduction, smoothing and noise reduction, advanced Lucy-Richardson deconvolution, and multiresolution sharpening. Photoshop CS5 used for levels and curves, high pass filter, star shrinking, screen mask invert, lab color, saturation adjustments, selective color, vibrance, match color and lens correction. Gradient Xterminator for gradient removal. Carboni Tools for additional noise reduction, and smoothing. HLVG for additional color correction. Registar for aligning stacks and composites and for color channel alignment. Focus Magic for focus restoration. Notes I was quite happy with the details I was able to capture in this galaxy. The galaxy has a faint outer halo, and I was also pleased with how well it came out.